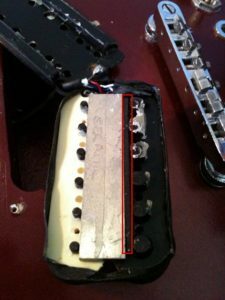 After installing my DiMarzio Tone Zone in to my Ibanez 20th Ann RG550RFR, I had been reading about the “half-air” mod, which quite a few people have performed on their Tone Zones. I was curious about it as I was wanting to find a way to get rid of some of the boomy low-end that the Tone Zone produces, and thought I might try the mod just in case I had no luck sorting it out by adjusting the pickup heights, etc. I thought that before I pulled apart the Tone Zone that I might try it on a cheaper pickup in a guitar I don’t use so much. I have a Saga PRS-style kit guitar that I put together several years ago, which I had installed Mighty Mite Motherbuckers in to. I have always found that this guitar, which has a very dark and prominent low-end tone sounded way too thick with the Motherbuckers in. The Motherbuckers are also extremely high-output pickups. I installed a ceramic pickup, as per the instructions in one of my previous posts on magnet changes in pickups. This opened up my pickup a little, and tamed the wild output somewhat, but it was still a little too thick, especially while picking on the low E string. 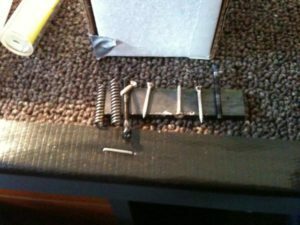 The “half-air” mod involves removing the bar around the screw pole-pieces in a humbucker, and sticking the magnet directly to the screws themselves, eliminating the contact the magnet makes with the lugs on the other coil. 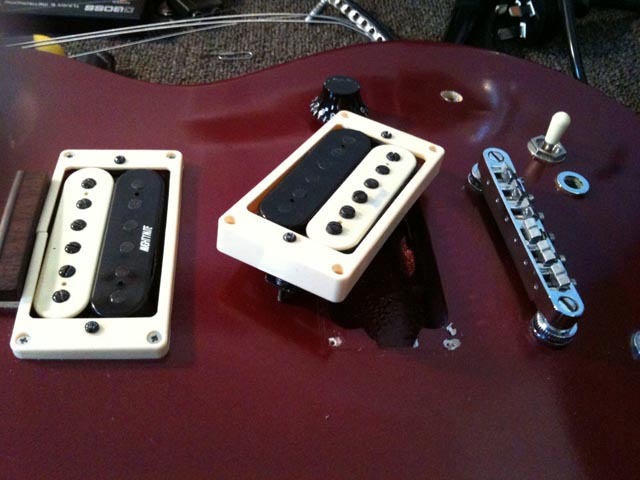 This idea is based on the “Air” range of DiMarzio pickups, where the magnet does not touch any of the pole-pieces. this results in an open sounding pickup with increased sustain. The “half-air” mod lowers the pickup output, and opens up the tone a bit, eliminating some of the lows, and increasing some of the highs. As always, take particular care when working with the insides of pickups. The wires are extremely thin, and if you break any you may be in for a world of pain to fix it! Get the strings out of the way. The first thing you need to do is get your pickup out of the guitar. Get the strings out of the way. This guitar has a tune-o-matic bridge and tail piece, so I de-tuned the strings, and unscrewed the tail piece, lifting all of the strings out of the way at once. 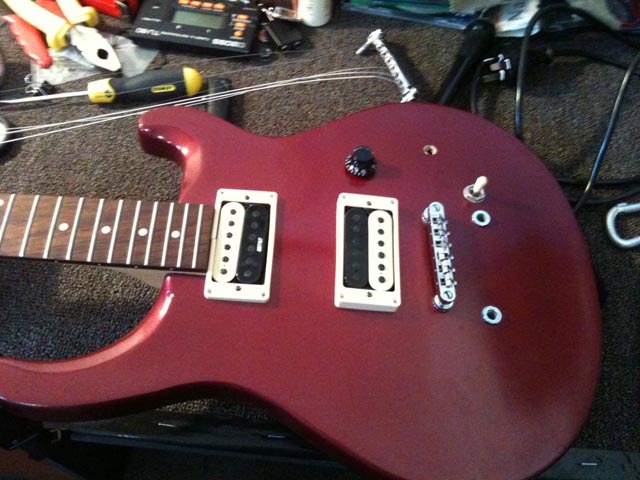 Remove the pickup ring or pickguard from the guitar. Remove the pickup ring or pickguard so you can get to the pickup. You don’t want to loose your screws and springs. I use a spare pickup magnet. They are not going to get lost when they are stuck to this. 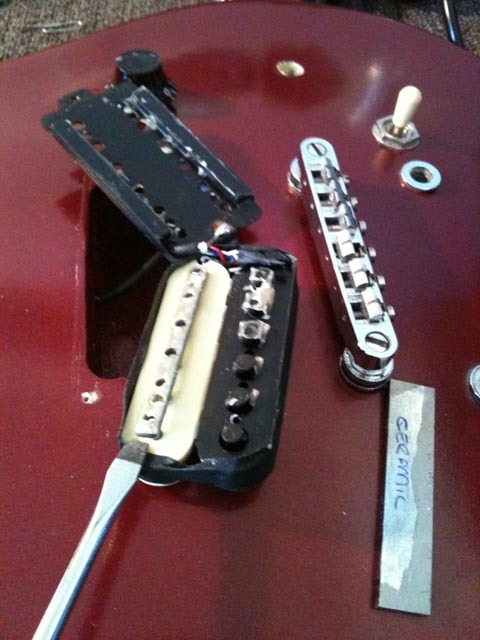 Remove the pickup from the pickup ring or pickguard. Remove the pickup from the pickup ring or pickguard. You need to do this so you can remove the pickup’s base-plate. Remove the pickup base-plate. There are 4 screws to remove. Carefully loosen the pickup tape around it with a stanley knife or small flat-head screwdriver so you can lift it right off the pickup bobbins. Remove the magnet from the pickup. Use a flat-head screwdriver to carefully lift it up. Take note of it’s orientation so you don’t make the pickup out of phase. I labelled it with some masking tape as you can see. Remove the metal bar that is around the pole-piece screw ends. Carefully remove the metal bar from the pole-pieces. I used a flat-head screwdriver to pry it up from the bobbins. Put the magnet back in, ensuring that it is pressed up evenly against the pole-piece screws. Put the magnet back in, noting orientation, and push it up evenly against the screws. Put something non-ferrous in-between the magnet and the slugs. Put something non-ferrous in-between the magnet and the slugs. I used a thin sliver of rubber sheeting that I had available to me. This is to ensure that the magnet stays “aired”. Once this is done reverse steps 5 to 1, and tune your guitar back up. 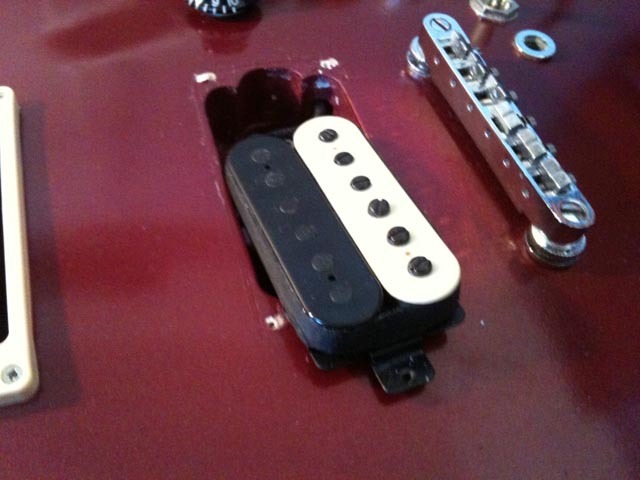 Plug in and find out what your newly modified pickup sounds like. I found that it tamed my Motherbucker a good amount. That was fine though, as I had plenty of space to increase the pickup height to get it really driving the amp again. The tone is definitely more “open” now and less a wall of sound, with the lows not so powerful, and a nice amount of highs added back to the sound. I am quite happy with how it turned out, and will definitely be leaving the pickup in this state. I’m still not sure if I’ll be performing this mod to the Tone Zone just yet, as I seem to have set it up just right for my ears. The mod is definitely worth trying though, not just to a Tone Zone, but to any other pickup that you might want to experiment with. 17 Responses to "Modifying pickups – the half-air mod"
Yes, it’s always interesting to experiment with pickups, gear and effect pedals… I am sure that looking for new guitar sounds is a great experience and often leads you to get inspired and compose a new cool riff or maybe a whole song! Just did the magnet swap and half air mod on a stock v8 pick up. Made a world of difference! Thanks for the tutorial! Hey there! So my Ibanez has the INF4 (bridge) and INF3 (neck) pickups. I’m sure you are aware of their tone, which is not great. I found on jemsite that the INF4 is an alnico (not sure what number) and the INF3 is a ceramic. I want to try and mod these to get some experience, as well as better tone. I want to do the half-air mod, what do you think about that? 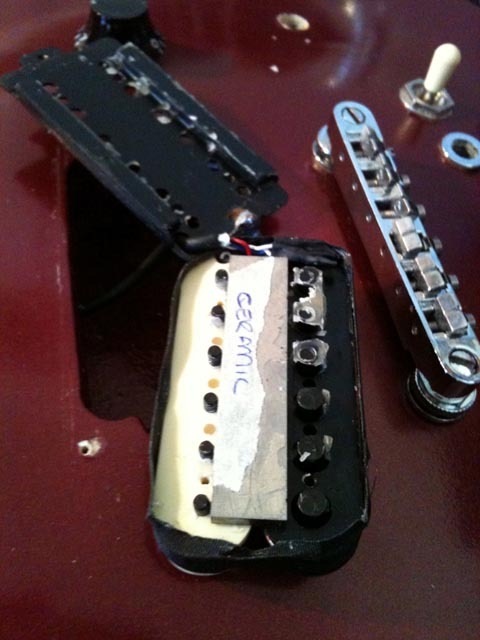 What about changing the magnets to alnico 5’s as well? Does this screw-up the wax potting? 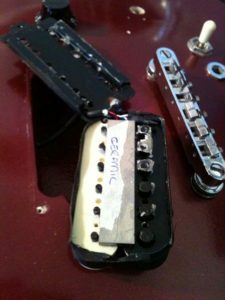 It can a little sometimes, but it’s easily remedied by heating the pickup with a hair dryer or similar for a short while if you find that the pickup is a little microphonic after completion. This was my first pickup mod ever and thanks for guiding me through jemsite forum. After correcting the mistake of placing paper instead of rubber, I realized the vocal quality of tonezone became a bit too much for my lead work. This particular guitar has a basswood body with bolt on maple neck with rosewood board and the pickups sounded just a bit bassy for my taste. The half-air mod fixed this without me having to place a high pass filter in line. The pickups are hot, living up to their name, making clean sounds a bit crunchy, and this also took some bite out in this area as well. I still feel the need to roll the volume pot down just a hair for a truly clean tone but not as much as before. The best part, I have to say, was the enjoyment that I got out of learning this mod. I have always considered pickups something to treat not necessarily as fragile, but almost reverently and to leave r&d to ‘the temple priests’ who have dedicated their lives to giving us mere mortals incredible tone. This project makes me want to get the Stew Mac pickup winder and try making my own models! So thanks again for this great tutorial! Actually what you did wasn’t air anything…. You removed one of the coils. Same as a coil split. The magnet now didn’t connect to the 2nd coil… The results can also be had by removing the pole pieces completely from one side. Fantastic results using the “half-air” mod. Got me a Dimarzio EJ neck humbucker, loved the crisp clean definition but it had way too much “ICE-PICK” in the ear in the treble and not enough old school fuzz to the notes if you know what I mean …. 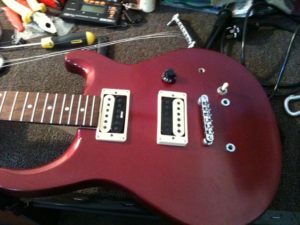 So together Using the Dimasrzio EJ neck and swapping the Magnet out to an Alnico II and the “half- air” mod over all I have a highly detailed musical tone that cuts thru the mix and without the “ICE PICK” overall its far more useful, better sounding neck humbucker.